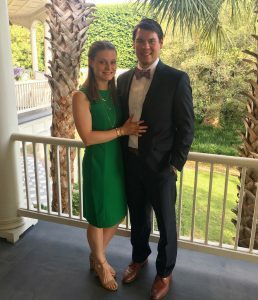 Over the weekend my husband Bernard and I attended a beautiful southern wedding in Charleston, South Carolina. Initially, I was going to write a post about a different topic, but I loved so many things about this wedding that I felt compelled to share. Incorporation of the couple and their love story. Their story began abroad in South America, where the Groom was from and where the couple would be returning post-wedding. 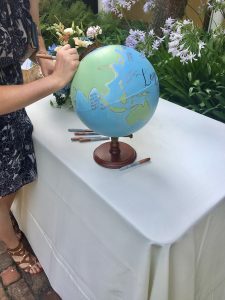 Their save the date showed a map pinpointing where the bride and groom were born; their guest book was a globe that guests could sign, and music infusing the groom’s culture were details that gave you a feel of who this couple is. Popsicles. The weather in Charleston over the weekend was ninety degrees and sweltering. When we arrived rather than everyone sitting in their seats and waiting, the guests were able to stand and mingle while trays carrying refreshing popsicles were handed out. I loved this idea; these were a pleasant cool down treat to enjoy before the ceremony. Ceremony Decor. Flower walls and decorative archways are becoming a common fad at weddings. 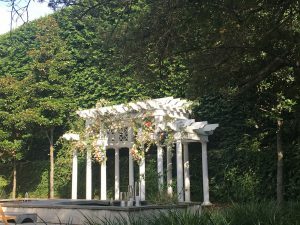 Sometimes I find this decorative trend to be a bit overwhelming; however, at this wedding, the beautiful archway covered in vines and pastel colored flowers behind which stood a giant green shrubbery wall took my breath away. Ambiance. I think lights and candles at a wedding are sometimes an underrated decoration. I feel the more, the better and in as many different styles as you can incorporate. The wedding this weekend had a variety of lights and candles in all different shapes, sizes, and styles. There was a giant Magnolia tree that was decorated with these awesome dripping lights that reminded me of jellyfish and candles floating in what looked like bubbles. The archways you walked under to get to the reception tent were lit up with candles in more bubble- like vases. The dance floor was illuminated by lights in round, and bell-shaped fancy beaded chandeliers. 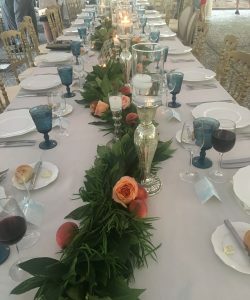 The dinner tables were adorned with votive candles in varying colors and textured glass holders, and the entire tent was lit by a lavish chandelier. Fancy Seating Area. I’ve now attended two weddings where a cozy seating area was set up just outside the dance floor. I love this idea because for older people or for those who feel that dancing isn’t their thing the seating area still gives them the ability to sit, watch and be a part of dance floor action. I acknowledge that everyone does not have the same budget; however, something like candles and lights depending on your theme can add a little pizazz to your day. 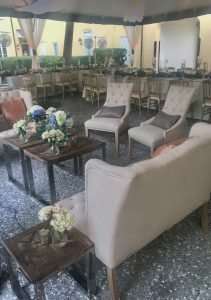 I love all weddings; I especially love the creative and unique ideas people come up with to set their weddings apart and add little details that make it their own. 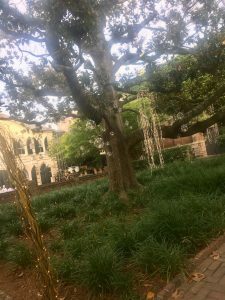 This entry was posted in Brides and tagged Charleston, Outdoor Weddings, Receptions, South Carolina, Southern Weddings, venues.